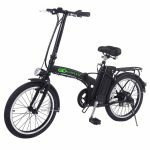 Ideal for commuting, the Folding Electric Bike can easily be stored in small spaces, great when on the train or for putting into the boot of your car. The frame folds via a 2 part locking mechanism which ensures the catch safely remains locked when the bike is in use and can be operated with one hand for a smooth folding action. The front V brake, and the rear expansion brakes result in controlled and reliable stopping, letting you safely make your way to work. Easy Compact fold and an efficient ride when ridden on paved surfaces. I had trouble assembling my bike. Once I finally got it together, I was a bit disappointed honestly. It’s good for short trips but not exactly what I needed for my commute and it seems a bit poorly made. Really impressed with the power this bike has! For the price, I didn’t actually expect such a strong kick and smooth ride. I did have trouble putting it together, but since then no issues. Have had too many problems with this bike to honestly recommend it to anyone. After a year many parts have broken and had to be replaced… the pedal assist, the chain, the light. It’s hard to take out the battery for it to be charged, which is super frustrating. Realistically, maybe this is why it’s slightly more affordable than these other bikes… However I have read some other really positive reviews, so maybe mine was just faulty? Had to replace the seat because of a lack of shock absorption. Otherwise is well built and good value.